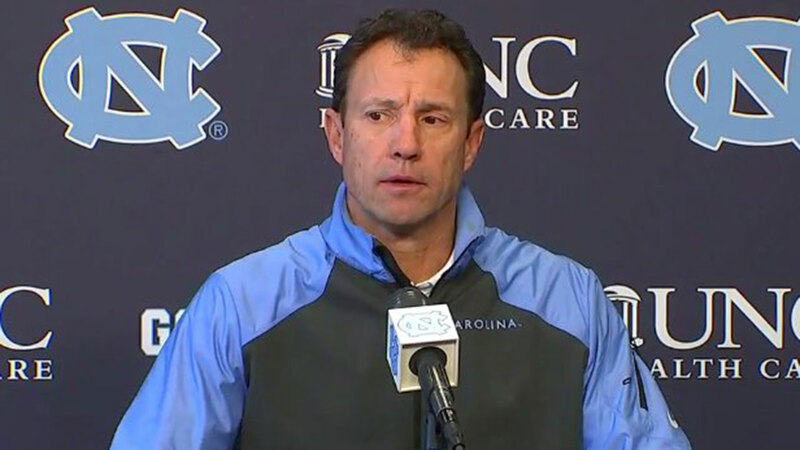 CHAPEL HILL (WTVD) -- North Carolina coach Larry Fedora said the Tar Heels should make the College Football Playoff if they beat No. 1 Clemson in the ACC championship game. "Yes, I do feel that way," the Tar Heels' fourth-year coach said when asked if No. 14 North Carolina would merit a playoff bid should it be crowned ACC champion. "If we beat the No. 1 team in the country -- and Clemson is the No. 1 in the country and a consensus No. 1, and they've stayed No. 1 for a long time -- if that happens, then I believe our team is deserving." "I feel there is a big opportunity for us to upset the number 1 team in the country, but it will be a tough game," Quarterback Marquise Williams said during a press conference at UNC Monday. After Saturday's 45-34 win at NC State, Fedora said there is "no doubt in my mind" the Heels should be in the playoff with a win Saturday. The top-ranked Tigers are considered a lock for the College Football Playoff if they beat the Tar Heels on Saturday (8 p.m. ET, ABC). However, the Tar Heels might need help in the way of teams losing to make the playoff even if they beat Clemson. As of last week's rankings, the Tar Heels (11-1, 8-0 ACC) were the lowest one-loss Power 5 team in the selection committee's rankings and were behind three teams with two losses entering Saturday. North Carolina figures to move up a few spots in Tuesday's upcoming rankings, though, as five teams ahead of the Tar Heels lost Saturday. Selection committee chair Jeff Long said previously that the Tar Heels' season-opening loss to South Carolina, which finished 3-9, and a nonconference schedule that includes two FCS teams hurts North Carolina's standing with the committee. Asked how Fedora would explain the loss to the selection committee, Fedora said he would point to the schedule, three turnovers and the Tar Heels' 11-game win streak since the loss. "If you look at our body of work the rest of the season and running off 11 straight games and the games on the road from Georgia Tech to a short week against Pitt, which was ranked at the time, to playing in Blacksburg when everyone in the country wanted Frank Beamer to win that game, we found ways to do it," Fedora said. "So I think this team is very deserving." During Monday's press conference at UNC, Fedora added he thinks their defense can play well enough to put them in a position to win.